How are your pipes looking lately? If your Silver Spring home has recently experienced some fall storm damage, your plumbing could be in jeopardy. However, if you need plumbing repair services in Silver Spring, Master Plumbing has you covered. Please keep reading to discover the benefits of professional plumbing repairs, and the signs that you may have a pressing problem. Affordability: Plumbing repairs aren’t always the cheapest of ventures. Luckily, when you come to Master Plumbing for your plumbing repairs in Silver Spring, we can give you the best price and save you plenty of money. Easy Repairs: Also, believe it or not, most of these repairs are so easy, we can complete them in a day or less. Depending on the severity of the problem, it might only take a morning or an afternoon. And then once it’s done, you can get back to your life. Our experienced and courteous plumbers will get the job done quickly, while saving you money. They Last Longer: Professional plumbing repairs yield a finished product that will last much longer than do it yourself repeairs. Perma-liner and epoxy solutions will not only stick around, but they can greatly contribute to preventing future damages and further problems. Preventative Maintenance: Preventative maintenance is an investment that pays off in the long run. Any massive issues will be identified and handled so that they won’t become a problem. Small fixes now can save you lots of headaches in the long run. Use Less Water: When your Silver Spring home is experiencing a leaky pipe, your utility bills will start to increase. When you schedule professional plumbing repair services, one of the biggest perks is that the repairs will enable you to start using less water. Water efficiency is just as important for the environment as energy efficiency is. Constant Puddles: If you see too many puddles in your Silver Spring home, chances are they are forming due to water leaks. Water leaks might originate in your kitchen or bathroom, but they could just as easily be coming from a loose window or leaky roof. Strange Noises: Do you hear odd sounds coming from your home’s plumbing? If you do, it could be another warning sign that something is wrong with your Silver Spring water supply. Lower Pressure: Are you fed up with taking showers that don’t deliver enough water pressure? Instead of fuming, call on the professionals to help you out. 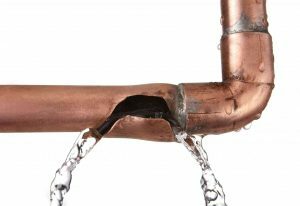 Loss of water pressure is another indicator of a major leak somewhere inside your home’s plumbing.